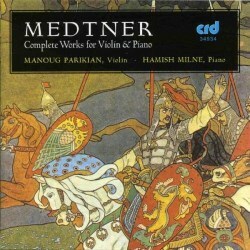 Although CRD released this two disc set of the complete works for violin and piano by Medtner in 1995, the performances themselves date from a decade or so earlier courtesy of the BBC. Aside from any inherent artistic and musical value this set undoubtedly has it also strays into the realm of historical too for enshrining the gorgeous playing of Manoug Parikian. Not least because the young Parikian rehearsed the 2nd Sonata with the composer with a view to broadcast until the older man's ill-health forced cancellation. Parikian's current discography is not exactly large and much of it is based on either historical recordings or live concerts neither of which are technically able to display his sovereign tone and technique to best effect. In typically rather neutral and understated way these BBC recordings do just that. Adding to the all-round excellence is the presence of Medtner expert Hamish Milne providing the not inconsiderable piano accompaniment. I have to admit that these works were unknown to me. At the time of these performances there does not seem to have been another complete set. Since then there have been various recitals featuring some of the sonatas or shorter works but complete sets from a pair of artists remain rare. Laurence Kayaleh and Paul Stewart on Naxos are one and Nikolay Karlovich with Linn Hendry on ASV (2nd hand or archive copies only) another. Chloe Hanslip, Vadim Repin, Lydia Mordkovitch amongst others have contributed single sonatas or discs. Given Medtner's near total preference for the piano in solo or concertante form the presence in his catalogue of these works is something of a surprise. According to Chris de Souza's valuable and enlightening liner note, one of Medtner's older brothers Alexander learnt the violin which prompted the younger Nikolai to teach himself reaching a very reasonable level - Parikian's experience working with the composer supports this. Furthermore, the 3rd Sonata is dedicated to another of the composer's elder brothers Emil who shared the composer's aesthetic outlook but with whom he had "one of the strangest relationships" according to de Souza. A feature that struck me listening to this entire set is how intelligently Medtner writes for the violin. This is by no means 'easy' music to play but it sounds wholly violinistic. The other feature is how the three main Sonatas span - almost equally spaced - more than twenty years of Medtner's composing career. And these are big works. Even the Sonata No.1 in B minor runs over twenty minutes but it is dwarfed by No.2 at twice that length and No.3 that at forty six minutes makes it one of the very longest in the repertoire. Time and again these performances strike me as near ideal. I appreciate I am saying that with no other versions to compare, but there is an instinctive, intuitive 'rightness' that exudes from every bar. Parikian plays on the 1681 'Amatisé' Stradivarius violin and it sounds absolutely gorgeous in his hands. Chris de Souza's excellent liner is very astute at highlighting the compositional brilliance that lies below the surface of these works. In many ways the 2nd Sonata - the work Parikian was due to perform with the composer - is the most remarkable example of this. It is written in one huge continuous arch of music performed without a break. In turn this divides into three distinct movement with the central panel in turn a set of theme and seven variations framed by two brief cadenzas. This is lyrical not tortured music but a work that is densely argued. As de Souza says (referring to the 1st Sonata); "In spite of his immense technical achievements and the sophistication of his compositional means, [Medtner's] music often expresses a simple childlike happiness even naivety. It sounds simple, but it isn't." In both the later Sonatas and his final work the Piano Quintet Medtner references his own song The Muse Op.49 No.1. Aside from providing melodic material, the associated words provide a literal subtext to both works. This cryptic skill with which he weaves into his work layers of meaning provides some of the reason why he was admired by his colleagues in his time but also remains relatively unfamiliar to many music lovers. The music is attractive and often beautiful but conversely it does not offer up its secrets easily or obviously. I have taken a long time to write this review simply because that is the time is has taken me to even begin to assimilate the music. But these are works which reward the engaged listener. Medtner writes complex often quite thick textures with little respite for either player. Time and again I found myself admiring the care with which Parikian and Milne 'layer' the music. In less caring hands I could imagine it all becoming rather unrelenting and opaque. Likewise, to reiterate the BBC-sourced production and recording. The norm of acoustically generous venues and a big up-front sound means that many modern recording feel artificially inflated. Add to that the dark-arts of digital editing and the result can be chromium-plated performances of apparently technical perfection - the musical equivalent of photo-shopping The recording here and the music-making sounds 'real'. There are very occasional tiny imperfections - a note that doesn't quite speak with the evenness of those around it - that somehow add to the beauty of the whole rather than detracting. Medtner's music is hard to label. He nods at his Slavic heritage - a turn of phrase or a rhythm will have a reminiscence of his homeland but this is not the music of an explicitly Russian exile in the way that much of his friend and compatriot Rachmaninov is. In terms of his use of form and harmony his music is firmly tonally based but with extended explorations in the manner of many composers of the 20th Century who chose to stay on the tonal side of the tonal/serial divide. But he avoids the tortured chromaticism that characterises many others writing at much the same time. For the independent forging of a musical path there are similarities with say, Delius not for one second in how the music sounds but rather in the individualistic way they chose to create a body of work unique to themselves quite separate from the fads and styles surrounding them. Some will see this as a reactionary stance, others visionary. So it is with the final sonata. This is a deeply personal work - given that it was completed in 1939 with Medtner living in North London - one that is singularly divorced from the fears of the world in which it was written. As mentioned it was dedicated to his brother who had died three years earlier so the tragedy and emotions it encompasses are inward and personal. But much of the first two movements - apart from the portentous opening - is remarkably buoyant in spirit but with the Slavic spirit peeking through in the Scherzo marked molto vivace e leggiero [lightly] especially. Likewise the third movement Andante con moto which is tinged with melancholy and soulful lyricism. The closing finale has a valedictory quality and both here and in the 2nd Sonata's finale Medtner is very good at pacing the music so that over the substantial span of music - around twelve minutes in both works - there is an impressive sense of cumulative power and inexorable forward momentum. Indeed, this is true of both these very substantial works in their entirety. More praise to be heaped on Parikian and Milne too who never overplay or force allowing the music to unfurl with a natural inevitability. Opening the second disc and completing Medtner's works for violin & piano are the set of 3 Nocturnes which pre-date the 1st Sonata and 2 Canzonas and Dances which have the opus number adjacent to the 2nd Sonata. Both sets are gems and far from slight. The Nocturnes inhabit a similar world to some of the violin music of Josef Suk and like the Suk, they deserve to be better known. Sensible programming by CRD to place these on the second disc as a musical pause between the rigours of the two big sonatas. The liner dates the recording of the Nocturnes and Canzonas and Dancers as March 1987. Parikian died in December that year, so I imagine this is one of his last substantial recordings. The CRD catalogue always boasted fine musicianly performances well recorded. In some instances with some of their catalogue it can be argued that they have been supplanted by more recent recordings. I would consider the reverse to be true of this set regardless of the quality and quantity of the competing versions. Judged simply by the criteria of performance and recording these are excellent. By the time one factors in the 'historical' added value of being part of Parikian's recorded legacy and his direct association with the composer and this brings a musical imprimatur to the discs that even the finest other versions cannot challenge. Powerfully impressive music performed with absolute authority - something of a revelation.